He was at the time speaking on the National Democratic Party (NDP) radio programme aired on ZBVI 780 AM yesterday evening. Host of the show was Dr The Honourable D. Orlando Smith (AL), Premier and Minister of Finance, and included as guests Dr The Honourable Kedrick D. Pickering, Deputy Premier and Minister for Natural Resources and Labour, Honourable Mark H. Vanterpool (R4), Minister for Communication and Works, Honourable Marlon A. Penn (R8), Junior Minister for Trade and Investment Promotion, and Honourable Ronnie W. Skelton (AL), Minister for Health and Social Development. 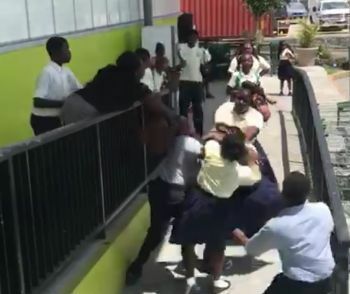 The fight among the Junior School students was caught on video and circulated on social media. Hon Walwyn said, “We have been having some disturbance by students. I know many persons listening to me now perhaps have seen videos going around with students fighting today. That matter needs to come to an end very quickly. It is very troubling to me. I want to take this opportunity now to say to parents to speak to your children about their conduct after school,” while adding that it is a difficult time and if they could get back to full day of school they would have done it already. 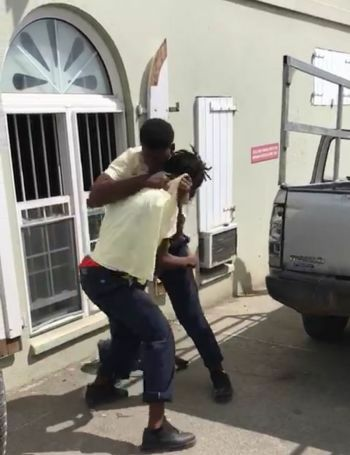 The education minister emphasised that he will not “tolerate” students fighting and they will be punished to the fullest extent for their misconduct. “We are working through a process but we also need the cooperation of the students because we are not going to tolerate students fighting in town, particularly in their school uniform. We are going to treat it exactly the same way as if they were fighting on the school compound and whatever disciplinary actions are necessary will be taken,” explained the minister. He further stated that Sandy M. Underhill, ESHS Principal, and all other high school principals, have his “full support and allegiance” when it comes to discipline, adding that they are trying to train the youth for the world. In addition, Hon Walwyn indicated that his ministry is working on fixing the recreational facilities that were damaged by the hurricane in September 2017, so that the children can have an “outlet to express themselves” instead of resorting to violence. It was Hon Walwyn who had stated last year that students of ESHS have been "wreaking havoc" in Road Town and that Government was looking to end the shift system as a means of addressing the problem. this crazy dude says one thing for public consumption then goes behind the scenes and does a next! In some other places you know what is done to those kind of people? These students need some stiff penalties cleaning up the garbage on the roads, working on the garbage trucks, cleaning public bathroom and disposing the elderly feces both at the Adina Donovan and Peebles Hospital for a 1 month. Just to name a few. But who is the man who not a few years ago interferred with a previous principal who wanted to suspent a student for hitting a teacher? Same one who sent students home on suspension back to school so they dont miss exams. You cant have it both ways. Either give teachers back the power to address these matters when it happens as long as students are wearing the gov uniform.....or go sit down. You cannot control what you are not willing to confront. The only difference between the students fighting now and 30 to 40 years ago, is there were no cell phones to record the fights. Same behavior. According to someone this is a result of, ‘come let we do this thing”. He crying fowl now when is he who created the monster. He has placed politics over discipline he needs to go home fast. By the way is this the man under investigation? Some times kids dont want to fight , but must defend themselves or fight back .. You need a better solution than just " fights not tolerated "
several years ago I was in traffic on my way to botanical gardens when school was let out. Right next to me was a big fight with girls. three against one. I kept yelling "stop it Stop it!" but the adults around were just watching with a smirk. It was right across from the police station and there was an officer directing traffic at the intersection saw the whole thing. NO ONE did anything. I went into the police station and reported it. They just shrugged their shoulders. I carry this upset with me even to this day. why this behavior?? I'm telling you these modern girls are societies biggest problem. Their tempers very hot. Very materialistic. They want to be gang or associate with a gang.. There are some very good ones. Sad the bad always out shines the good..
@Another Chance ( I hate that I have to agree with you 110%. This present breed of people (in this case) teen girls/young ladies are into this ratchet speed that seem so cool and legit mainly because their street influences is inspired and I encourage by mature ratchet individuals on the social media called Facebook. The life of ratchet seems cool and well paid but truth be told. It’s not. I really hope MALE (females ) version gets fully going, but hope not just teen girls sign up but some mature grown in age young in mind woman should attend as well. Sad the bad Girls out shine the hard work, kind sweet talented girls who’s doing well. Build proper schools with qualified teachers and a credible plan to catapult our kids past Singapore and the likes for discipline and attainment. It’s your job.